The day began with coffee, bagels, and some hearty discussions about experimental data. The University of Delaware’s fifth Neutron Day was held Wednesday, Nov. 8 in Perkins Hall and the Patrick Harker Interdisciplinary Science and Engineering (ISE) Lab. This year, Neutron Day was a celebration of more than its namesake subatomic particle. UD’s Center for Neutron Science (founded in 2007) recently entered into another cooperative agreement with the National Institute of Standards and Technology (NIST) Center for Neutron Research (NCNR). 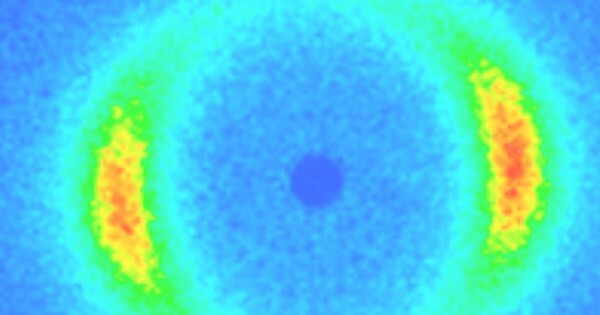 Under this new agreement, UD’s Center for Neutron Science will advance the field of neutron scattering by developing new techniques, applying these techniques to new applications, and training the next generation of neutron scientists. The agreement began on Sept. 1 with $1.7 million of funding and projects a funding total of more than $8.7 million through Aug. 31, 2022, which brings the total funding to the center to well over $30 million over the past ten years. Neutron scattering techniques utilize neutrons, which are subatomic particles with no net electrical charge, to probe the structure of materials. Neutrons can penetrate many substances without being absorbed. By studying how these neutrons interact with the subatomic particles in the host material, researchers can learn new insights about that material. For certain materials, neutron diffraction is superior to other characterization methods, such as X-ray diffraction. Under the new cooperative agreement, Wagner and his collaborators will use techniques such as small-angle neutron scattering, very small angle neutron scattering, neutron reflectometry and neutron spin echo. They will also develop new methods, including a new interfacial rheology-neutron reflectometry sample environment. This partnership gives UD faculty and students access to world-class equipment. Under the new cooperative agreement, the Center for Neutron Science will fund faculty, staff, doctoral students, and postdoctoral associates, some of whom may take temporary residence at the NCNR. Other UD scientists and engineers are located at the NCNR to design, build, and operate some of the world’s most sophisticated scientific equipment. Undergraduate students can even benefit, said Wagner. Scientists from the Center for Neutron Science will also work with academic and industry partners on research that addresses “grand challenges” in sustainable energy, human health, and nanomaterials, Wagner said. The results could lead to better materials, from concrete to medicines. “We want to solve fundamental science problems that will make a big impact,” said Wagner. Neutron scattering could enhance the research of many scientists and engineers from both UD and the private sector. At the Center for Neutron Science, researchers offer one-on-one consultations and feasibility studies to faculty and industry partners. “We help scientists and engineers in academia and industry who don’t yet know that neutron scattering could be part of their success,” said Wagner. Eric Bloch, an assistant professor of chemistry and biochemistry, is just one UD professor working with NCNR. Bloch uses neutron diffraction to study the interaction of small gaseous molecules with porous solids. He aims to develop materials that can store hydrogen and methane for eventual use in cars and other machines. Bloch has used neutron diffraction since he was in graduate school, but the relationship between UD’s Center for Neutron Science and NIST allows him increased access. He can go directly to NCNR or send students there instead of sending samples and waiting for results—his experience in graduate school and a more typical scenario when university researchers collaborate with national laboratories and other user facilities. Dan Neumann, Group Leader for Neutron Condensed Matter Science at NCNR, said that the partnership between UD and NIST is pushing the field forward. “These are people that become part of the neutron scattering community in the United States, and that’s really exciting to us,” he said. More than 80 people attended Neutron Day, which featured several 20-minute talks by speakers from UD and NIST. More than 30 scientists and students presented posters on their research during a mid-day poster session. Participants buzzed from poster to poster in the lobby of the ISE Lab, asking questions and familiarizing themselves with new projects and fresh findings. For example, Melody Morris, a doctoral student at UD and a member of the Epps Research Group, displayed a poster of the group’s work studying lithium ion distribution in a block copolymer electrolyte. When she started graduate school, Morris knew she was interested in the field of scattering. “Whether that was X rays or neutrons, I didn’t know, but I was excited by the work of my group and Norm’s group,” she said. Now she makes periodic visits to NCNR to do research and has been a co-author of multiple papers, including a special talent article in Macromolecular Chemistry and Physics earlier this year. Neumann said the opportunity to connect with students and scientists in the field is a highlight of this event. “The thing we really look for in Neutron Day is actually having a chance to interact with the faculty and the students at the University of Delaware,” he said. “We’re a user facility, so that means people come and work with us, and one of our key partners in making this happen is the University of Delaware,” he said. During his speech, Neumann talked about advances in neutron scattering at NIST. He presented data from very small angle neutron scattering experiments that had heretofore not been shown outside of NIST. During his talk, Wagner spoke about the promise of neutron scattering in biopharmaceutical manufacturing, preservation and delivery. For biopharmaceuticals, drugs made from biological sources such as DNA, stability and delivery can be a challenge because these drugs are composed of delicate molecules. Neutron scattering is an ideal technique for studying these substances in their natural environments. Wagner and his team are using the unique capability of neutron scattering to look at molecules and go back to the formulators to help them develop better products. This could help patients stay healthier while decreasing treatment costs. For cancer drugs, this holds particular promise. “If you have to go in for a four or five-hour therapy on an intravenous drip, that takes a long time and it’s expensive,” said Wagner during his talk. Ideally, a biopharmaceutical drug could be injected under the skin, but that would require proteins to be concentrated differently than they are now. This is just one of the areas scientists are using neutrons to study. Scientists worldwide are collaborating to understand, engineer and control these substances. A common thread throughout the day was the idea that neutron science is powerful and could lead to discoveries with widespread impact. “Neutron scattering is a truly international endeavor,” Wagner said during one session.